This dish is hearty, filling, and full of flavor. Bonus: it’s vegan without the egg. But don’t tell the carnivores–they don’t seem to have a problem with it so far! 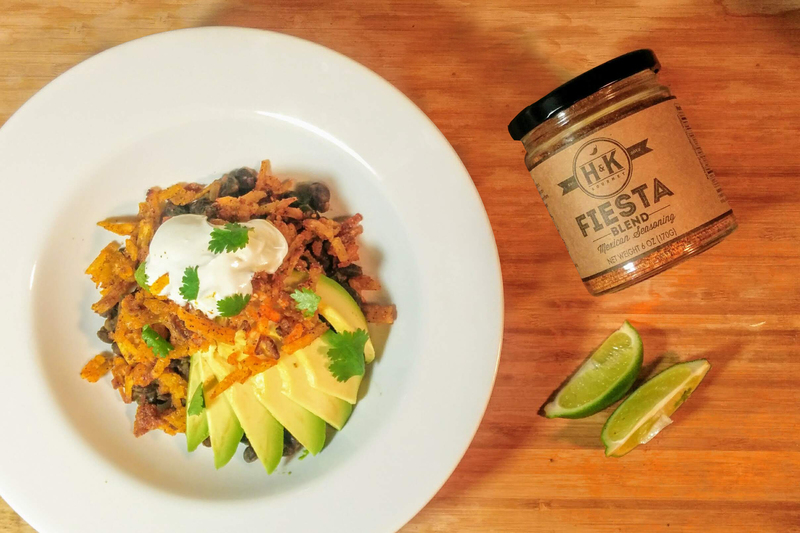 With Green Point Trading Company’s Black Bear seasoning and H&K Gourmet’s Fiesta seasoning (both found in our Campfire Kit), this recipe looks hella fancy but is easy to prepare with just a little patience. Heat vegetable in a small saucepan. Add onion and garlic and sauté for 2 minutes, or until very fragrant. Add beans and Black Bear seasoning. Cook for 1 minute, stirring constantly so that nothing burns. Add beer (or alternative liquid) and simmer, stirring occasionally, until most of the liquid has evaporated. Finish by stirring in 2 tbsp orange juice and cooking for another minute or two. Cover and hold warm. Using a box grater, shred the unripe plantain. Heat vegetable oil over medium heat in a deep pan. Add shredded plantains and cook until they are a deep yellow color, about 4-6 minutes. Stir or flip as necessary for even cooking. Using tongs or a metal slotted spoon, carefully remove plantains to a cool plate lined with paper towel or cheesecloth (a great use for the flour sack towel from your Culinarie Kit). Allow to cool for five minutes or more. Pro tip: If you want to speed up the plantain process in the future, you can freeze them after the first fry and jump straight to the last step next time! Turn the heat on the oil to medium-high. Return plantains to the oil and cook until they are just starting to brown on the edges, then remove them (carefully!) once again to drain. In a large bowl, toss plantains with Fiesta seasoning. 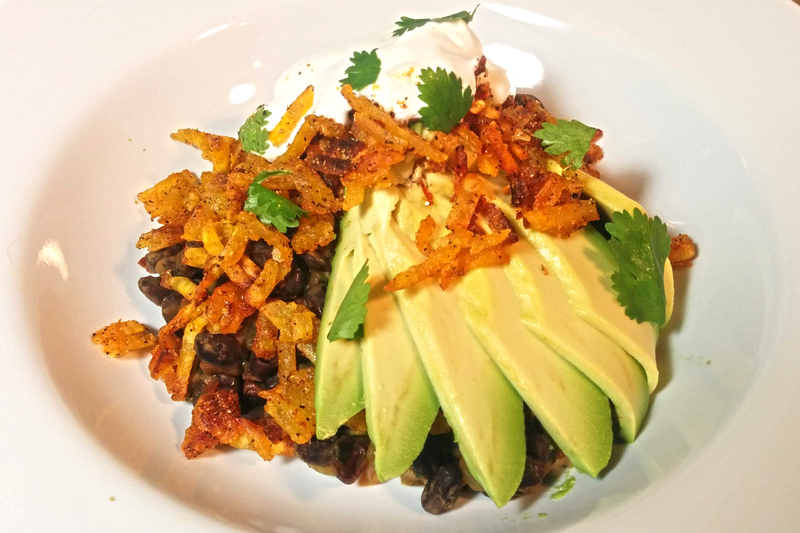 Serve over black beans with fresh cilantro, sliced avocado and a squeeze of lime. We even added a fried egg to ours! The Black Bear and Fiesta seasonings featured in this recipe are included in our Campfire Kit. Grab yours and get cooking! Next New Box Theme + A Big Announcement!